After more than 20 years the Stockholm Jazz Festival has earned a reputation for being one of the biggest and best events of its kind in Europe. 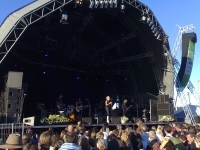 Top international and local jazz, blues, soul, funk and Latin stars perform over the seven-day festival on the island of Skeppsholmen. The Jazz Festival has already grown a huge amount, now taking place over a full week, including about 20 different venues and more than a hundred concerts. Skeppsholmen is still the main venue, giving the festival its beautiful trademark backdrop of the Stockholm harbour. Apart from the best jazz musicians Scandinavia has to offer, the festival attracts heavyweight international stars. Past performers include the likes of Dizzy Gillespie, BB King, Stan Getz and Miriam Makeba. Although the festival embraces a loose definition of jazz, and includes some related genres, there is a drive by locals to ensure the event ultimately remains about jazz, which will keep purists happy. No festival pass is available so tickets must be bought for individual concerts. Tickets are sold at each venue and online. More than 30,000 people attend the festival annually. Prospective attendees should check the official website for the full programme. Venue: Main venue: Museum of Modern Art, Skeppsholmen.